In the "Integrations" tab you can enable and edit some useful features available for Love Factory: reCAPTCHA, Gravatar or Google Maps. And if also using Chat Factory, they can be integrated for membership based access to IM. With Chat Factory implemented you can offer your users an IM chat feature. Users list allows you to either display all the users on it or just the user's Love Factory friends. For access control, visit our Chat Factory Integration Guide. reCAPTCHA is an anti spam solution integrated into Love Factory. To get reCAPTCHA public and private key visit this website. Enabling "Gravatar" will allow members to add their Gravatar image. User's registration email will be used. In the "Google Maps" section you can configure the map shown on the Members Map and Search Radius page. Enable the feature and click on "Obtaining an API Key", follow the instructions from their documentation and add the API Key. The Distances unit setting allows you to change the unit used on the map between kilometers and miles. 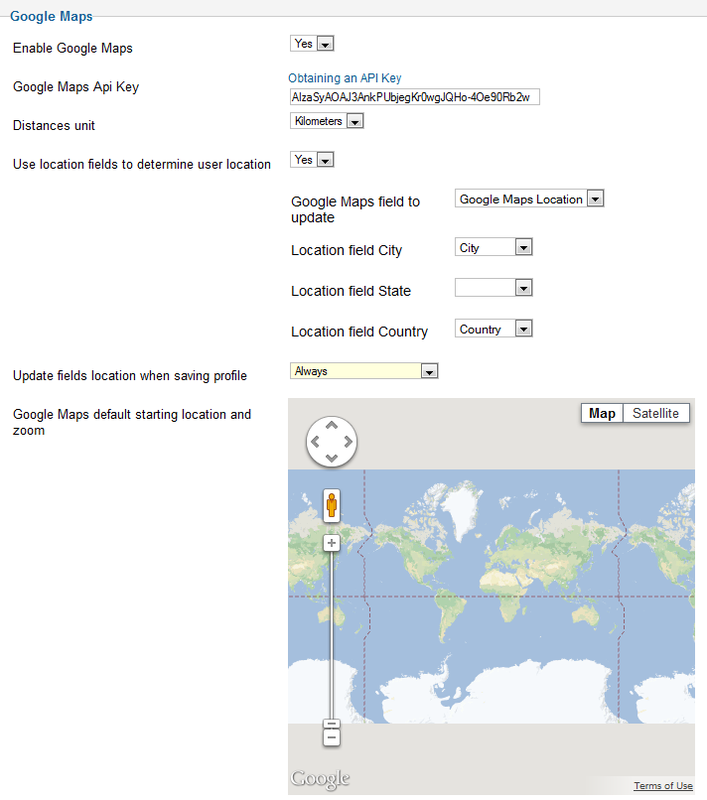 You can set to use location fields to determine user location and assign the specific fields below. By using this, the map coordinates will be selected based on the user's location automatically. You can chose to update fields location when saving profile only when there were changes made or always, even if no changes were made. The map shown below will allow you to choose a default starting location and zoom.